The financial services operation managers are given the task of handling financial and investment-related operations. They are the individuals who are equipped with many skills and are demanded by many financial institutes. The Financial Service operation manager can write a resignation letter while leaving the job for any reason. We all know that resignation letter is a formal document and it should be kept brief. There are few things that should be kept in mind to write a brief resignation letter. The first thing is avoiding the explanation for leaving the job. As a professional person, you are not required to tell the current employer that why you are resigning. However, if you are willing to provide the reason, then you can. It can be a little risky to provide the explanation. For example, if you tell your current employer that you are leaving the job because you have got a better opportunity, your employer may contact your new workplace and speak ill about you. A resignation letter shouldn’t criticize the job. You are not required to tell your boss that why you hate your job and why you have decided to quit. No matter how bitter you are, it is not recommended a place to write negative things. The tone of the letter should be totally professional which means that emotional statement should be avoided completely. 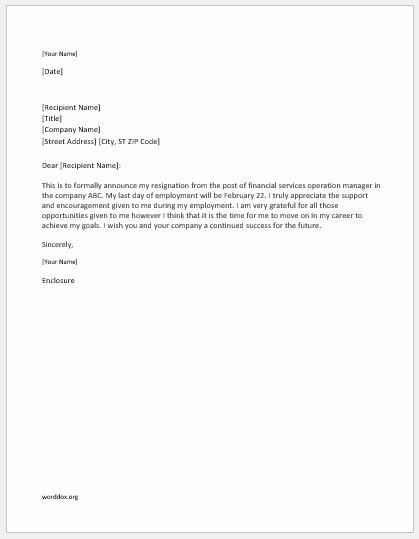 Here is a sample resignation letter to give you a proper knowledge about a professional resignation letter. This is to formally announce my resignation from the post of financial services operation manager in the company ABC. My last day of employment will be February 22. I truly appreciate the support and encouragement given to me during my employment. I am very grateful for all those opportunities given to me however I think that it is the time for me to move on in my career to achieve my goals. I wish you and your company a continued success for the future.